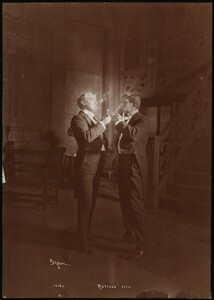 1SCENE: —Hall in country house of LORD AMERSTETH, Milchester Abbey, Dorset, England. Dark oak, heavily wainscotted.2 Broad staircase L.C. leads to a balcony that extends across two sides of room — the way to upper rooms. At head of staircase a door. Exits R. and L. from balcony. A high window R.C. at back, of clear glass under the balcony and opening to floor- above the balcony this window is of fine stained glass. A high window of clear glass just below balcony, through which the moonlight floods staircase and the balcony. Fireplace L.I. with open fire — door to library R.I. Between fireplace and staircase, an arch that leads to dining room, exterior and lower parts of house. Between door R.I. and window a tall cabinet concealing a safe — Electric lights — carved oak furniture – and ancestral portraits where space will permit. Clock strikes 10 as the Curtain goes up on empty stage. Electric lights on newel posts at foot of stairs and on Mantel. Lights are low. Moonlight outside. Enter French Maid, MARIE, from door at head of stairs. She goes to C. of balcony and listens. Low whistle heard off stage up, this seems to be what she listens for. She comes quickly but stealthily, down the staircase, Pauses halfway down, looks off L. through arch. MARIE: With the diner they are occupied. CRAWSHAY: Is the crib empty? MARIE: Il fait froid, Monsieur?3 I will shut ze window. GOLDBY: Oh, it’s you, Ma’m’selle. MARIE: Miladi tell me — zey keep zis ‘ouse so ‘ot. GOLDBY: I might have known. Always prowling about. MARIE: Ne comprend pas.4 Is the diner nearly finish? GOLDBY: It should be — I did my best to catch her ladyship’s eye; but they’ll sit and listen to Mr. Raffles till all hours. He’s a masterpiece! CRAWSHAY: Lively now — w’en’s it to be — to-night? CRAWSHAY: Good girl! W’ere’s the safe? MARIE (points at cabinet): There. CRAWSHAY: Gawd love yer, let’s ‘ave a look at it. MARIE. That is not necessary. Madame ‘as not place the diamonds there for many nights. She takes them to her room. She wears them to-night. CRAWSHAY: Then it’s as easy as kiss me ‘and! You’ll give us the tip? MARIE: Then come to this window. MARIE: I shall give to you ze necklace. CRAWSHAY: Good girl! You’ll find us at the old digs, you know, off the Fulham road. MRS. VIDAL: What a perfect night! GWENDOLINE: Leave the windows open, Marie. LADY MELROSE: You may smoke here if you like, dear Mrs. Vidal. MRS. VIDAL: A thousand thanks, but I said a breath of air. LADY MELROSE: I will take my coffee in the drawing-room. ETHEL: Isn’t A.J. Raffles a topper? GWENDOLINE (laughing): Mr. Raffles seems quite nice. ETHEL: Quite nice! You know you think he’s just topping. GWENDOLINE: I think we all admire him. ETHEL: Well, it’s all you need tell me. I have eyes. ETHEL: Harry Manders is out of the running. A.J. Raffles wins you in a canter, and he’s the right horse. 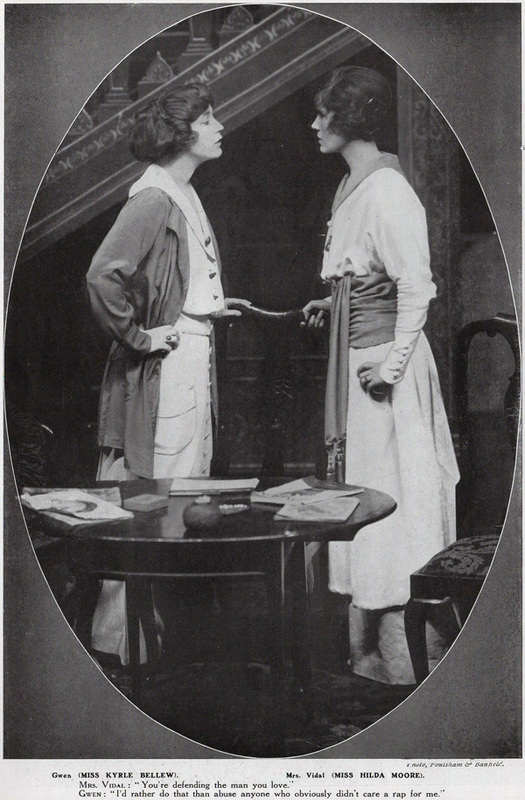 GWENDOLINE: Ethel, you are a dear, but you really mustn’t. ETHEL: Oh yes, I must! Besides, Mr. Raffles is worth a hundred Bunnies. GWENDOLINE: I don’t allow that. Even if I did, it takes two to make a love affair that can be mentioned. ETHEL: Three, in this case. ETHEL: Yes. What price Mrs. Vidal? GWENDOLINE: I wonder if anything ever escapes your notice? ETHEL (triumphantly): Not a great lot. But you haven’t told me what you think of Mrs. Vidal. ETHEL: A bit off I think. And she looks at Mr. Raffles as though she owned him. Talk about – green-eyed monsters!7 I should be sorry to have this one for an enemy. GWENDOLINE: I should be sorrier to have her for a friend. ETHEL: I want to know why she was invited. GWENDOLINE: Here’s Lady Melrose. You’d better ask her. LADY MELROSE: My dear child, never criticize a guest. Major Vidal is connected with us-distantly, I grant, but as long as she is only his grass widow8 we must show her some attention. She may not be one of us, my dears, but her marriage entitles her to our respect. MRS. VIDAL: A lovely moon with an ugly ring round it. Do you know I shouldn’t be surprised if there was no play to-morrow. ETHEL: How horrid of you! MRS. VIDAL: Go and look at it! ETHEL (rises): Come on, Gwen. MRS. VIDAL: Dear Lady Melrose, I am so very glad to have just a moment with you alone. I’m afraid I’m going to take a great liberty. MRS. VIDAL: Yes, I wish to warn you that Mr. Raffles is really too attentive to your sweet Gwendoline. LADY MELROSE. Mr. Raffles is an old friend. MRS. VIDAL: No one knows who he is. LADY MELROSE: Everybody can see what he is. MRS. VIDAL: I am not so sure of that. LADY MELROSE: Besides, you should speak for yourself. We know all about Mr. Raffles. He is, to be sure, the younger son of a younger son,10 but the family, my dear Mrs. Vidal, is- a family. He goes everywhere, knows everybody, has everything, and is the champion cricketer of the world. MRS. VIDAL: I have seen him in a less favourable light. LADY MELROSE: Then I should keep the incident to myself. 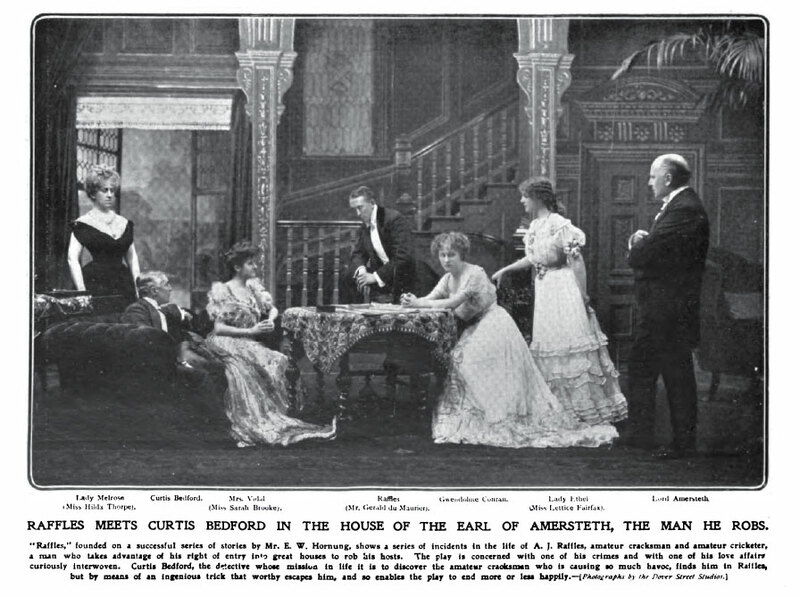 LADY MELROSE (turns to MRS. VIDAL, throws paper down on table): Might have done far worse – if Lord Amersteth had listened to young Manders, for example. ETHEL (Comes in): Aunt Fanny- Do join us, the night air is delicious! ETHEL (comes down, sits deliberately in chair): Are you sure that seeing her will help you, Mr. Manders? BUNNY (after a pause): You mean she won’t look at me now Raffles is on the scene. ETHEL: He does get in the foreground, I’m afraid. ETHEL: It isn’t his fault either. We only allow him in the middle distance when he’s got to bowl or bat. Gwen isn’t the only one. We’re poor flies,11 Mr. Manders. BUNNY (rises, turns to her): I do! I haven’t had a minute all day. Is Lady Melrose right? Isn’t there– any hope for me? BUNNY: No, but she looked it, and I want to know. I may be unworthy – who isn’t? But you know how long I’ve loved you –how I’ve waited and waited. I’ve come down for your decision. The cricket’s a mere pretext so far as I’m concerned. There’s the ring- won’t you wear it? GWENDOLINE (half refuses it- taking ring involuntarily): Harry, I can’t wear it now. BUNNY: I could understand it. He has been down here all the week – the hero of every match. I’ve only come for the Saturday’s show – to turn out and make a fool of myself all to-morrow for the sake of a kind word from you tonight. You won’t speak it. You’ve spoken them all to Raffles. I know his glamour. I was his fag at school.12 He was always the same. The most extraordinary man I ever knew. No good at work. Nothing out of the way at his other games. But he was the best slow bowler we ever turned out-13 the best and straightest chap- a plumb straight. He did some funny things, did A.J., but never a mean thing, and I loved him better than a brother. I would give him all I’ve got in the world -but I’ll never give him you. GWENDOLINE (rises, puts back ring on table): You’d better wait till I’m yours to give. BUNNY: Oh, I think not, thanks, Crowley. CROWLEY: Why not, my dear fellow? BUNNY: Well, I can’t afford it, for one thing. CROWLEY: Can’t afford it!- that’s quite unique. BUNNY: Not in my case, I’m afraid. CROWLEY: I thought you were so keen. 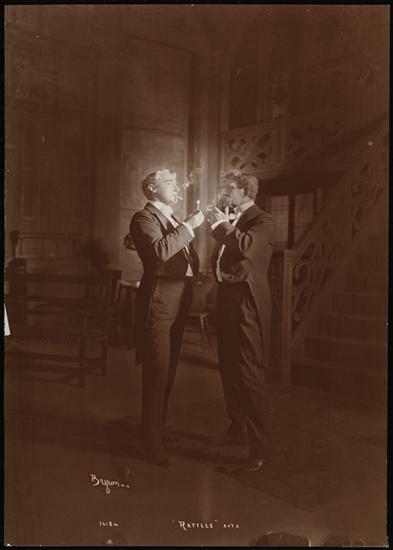 CROWLEY (shrugging): Well, my dear fellow, if you couldn’t afford it you were a fool to play. BUNNY (rises irritably): Oh, confound you, Crowley, if you talk like that, I will play you; and if you want to gamble, we will gamble. CROWLEY: I say! I say! I say! BUNNY (stiffly): Can’t you afford it? CROWLEY: You’d better come and see. BUNNY: Come on, my luck must change – at something. RAFFLES (outside laughing): But I mean it, I assure you. LORD AMERSTETH (laughing): Then, my dear Raffles, you should stand for Parliament without delay. Your gift of sophistry would charm the House- but don’t you try it on your electorate! ETHEL: Anyone who has seen Mr. Raffles do six inches on a plumb wicket will vote for him without respect of parties! RAFFLES (laughs): No, but the games are exactly alike- a Government at the wicket and an Opposition in the field – as the staff of Punch discovers every year. And individual convictions are not everything, Miss Conran. The world judges us as it does a Bank of England note – by face value. MRS. VIDAL: Ah! But the Bank of England guarantees the note. LORD AMERSTETH (laughing): The question is, can we guarantee the Bank of England against your friend the Cracksman? LORD AMERSTETH: Mr. Raffles has been entertaining us by contending that the Amateur Cracksman is a public benefactor. RAFFLES: I was only suggesting that what was really wanted is an Incorporated Society of Thieves, with some public spirited old forger to run it on business principles. LADY MELROSE: Mr. Raffles, how dare you? LORD AMERSTETH (laughs to LADY MELROSE): I told you so. RAFFLES: Then we should have a clearing house for the exchange of plunder- where the rightful owners might recover their property at a preferential tariff. LADY MELROSE: Really, Mr. Raffles, I do wish you wouldn’t discuss the Amateur Cracksman, (placidly) you din17 an enemy in ears who will very soon steal away my nerves. LORD AMERSTETH: My dear lady, the Cracksman must be discussed. Not content with his season’s work in town, here he is in our own countryside, raiding our neighbours right and left; our own turn may come any night. 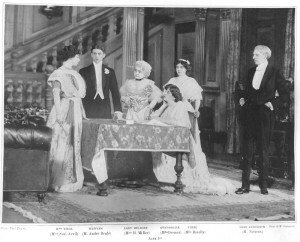 LADY MELROSE (touching necklace): Ah, don’t say that you expect him here! LORD AMERSTETH: I do, and the sooner he turns up the better. I’m ready for him. ETHEL: Who is the Cracksman? That’s what I want to know. LORD AMERSTETH: So does Scotland Yard. Every time Scotland Yard fails to catch the perpetrator of some decently intelligent theft- it is the Cracksman. MRS. VIDAL (looking at game of Patience): Ingenious. GWENDOLINE: You think there’s no such person? RAFFLES: I think there’s the shadow of such a person who would be very glad to be half as clever as they make him out. MRS. VIDAL (leans across table towards RAFFLES): Would your shadow have done that, Mr. Raffles? RAFFLES: Why not? He’s human. He has his weak moments. LORD AMERSTETH: And now this affair at Gray Towers. RAFFLES: The night I came down? LORD AMERSTETH: Our chief Constable is quite certain it’s the Cracksman. GWENDOLINE: I wouldn’t be in your necklace, Auntie! ETHEL (rises): Let’s all sit up and watch for him; the men armed- (acts it) -the women loading for them -(acts it)- and Mr. Raffles in charge of the side! LORD AMERSTETH: My dear ladies, is it possible that you forget the little precautions I have made it my business to take on your behalf? ETHEL: Of course we haven’t! LORD AMERSTETH: Then it may interest you all to hear that I am about to set the seal on our defences. The cleverest detective they ever had in America22 is coming to me for a conference. (Looks at his watch.) I am expecting Mr. Curtis Bedford every minute. LORD AMERSTETH: Yes, he has been over the ground at Gray Towers, and he says he’s picked up the trail. GWENDOLINE: Mr. Bedford! A detective! RAFFLES: Something more, Lady Ethel. A cut above poor dear Scotland Yard. LORD AMERSTETH: The same man, once the Sherlock Holmes of New York24 – incredible captures, colossal fees. Now, quite an exceptional specimen of that very modern type, the English country gentleman from America. Rewards can’t tempt him, but the Cracksman has. Bedford’s the man for him, Raffles, you mark my words! RAFFLES: I look forward to meeting him, Lord Amersteth. BEDFORD: Proud to meet you, Madam. LORD AMERSTETH: And Mr. Raffles – Mr. Bedford – a man after your own heart. RAFFLES: A pleasure I have long anticipated. I know your fame as a detective. BEDFORD: Sorry for that- regret of my life that peaches and cauliflowers have not established my fame – on a new basis. Always hated that name “detective”-did it for my own pleasure entirely. Once or twice fortunate enough to guess a riddle that puzzled the police – pure sport – love of the game. ETHEL: Of course- you can tell us who the Cracksman is, Mr. Bedford? BEDFORD: Guess I can-ideal crook -crème de la crime -best ever- but I mean to have him all the same. MRS. VIDAL: Mr. Raffles would have us believe he is a myth. BEDFORD: But you don’t believe anything of the sort, Mrs. Vidal- (turns to RAFFLES): No more does Mr. Raffles? RAFFLES: Now you’re here to protect us, Mr. Bedford, perhaps I don’t. BEDFORD: You agree with me, sir – man of culture – education – position – not the criminal class at all? BEDFORD: No! Yet I guess you’re on the visiting list at half the cribs he’s cracked; he may be one of your own set, no doubt the last person on whom suspicion is likely to fall, one who finds his safety in our midst. BEDFORD (to RAFFLES): You may know him! I may know him! MRS. VIDAL: I shouldn’t wonder if I did know him. BEDFORD: Any one of us may, my dear Madam! Fill the bill in some prominent part, and you’ll never be suspected of doubling it with another of equal prominence. Why, if I were to go to Scotland Yard and give myself up as our friend the Cracksman, they’d look up my bowling analysis and show me the door for a harmless lunatic. BEDFORD: Now that’s a very interesting theory. MRS. VIDAL: He seems to know all about it. LADY MELROSE. He needn’t practise what he preaches. GWENDOLINE: I don’t care if he does. RAFFLES: Ah you see, I have friends at Court, Mr. Bedford. BEDFORD: Chances are the Cracksman is not less popular. You know his battle-cry? ETHEL: Victory or Wormwood Scrubs! (Laugh). Why, he stole the famous gold cup from the British Museum, came away with it in his hat and then sent it down to Windsor as the Coronation Gift of the Criminal Classes. RAFFLES: No, he didn’t, did he? What an extraordinary chap! BEDFORD: He mustn’t have the chance. (Peers at necklace.) Lady Melrose, if you permit me to say so, what superb stones! RAFFLES: They make one’s eyes water. LORD AMERSTETH: You should feel the weight of them. Let Raffles handle them, my dear. BEDFORD: Should be glad to examine them, myself. May have to identify them – some time. LORD AMERSTETH: I trust not. RAFFLES (handling necklace): What a weight! beautiful! BEDFORD: In Amsterdam or Paris, every stone could be sold separately without detection. LORD AMERSTETH: Seriously, Bedford, is there any positive clue? BEDFORD: Guess he’s too clever to leave positive clues. RAFFLES : Then he will never be – discovered. BEDFORD (Bus.29 with cigar ash in ash tray on small table): Every pitcher goes to the well once too often. The Cracksman will be caught. RAFFLES: Indeed! As a purely sporting proposition I’m inclined to give odds against it. Who’s to describe him? Who can identify him? Who has ever seen him in the flesh? RAFFLES (coolly): You should communicate at once with Scotland Yard. MRS. VIDAL: I have thought seriously of it. RAFFLES: Meanwhile, won’t you gratify our curiosity? MRS. VIDAL (watching RAFFLES keenly): Yes. (Shuffling cards.) It was in connection with the “Great Pearl” affair on the German Lloyd Steamer between Genoa and Naples. (Shuffles cards on table -looks at RAFFLES). The other– well- the pearl was missing one day about dusk – and the other was accused of taking it. There was an English detective aboard. BEDFORD: Mackenzie – since dead. MRS. VIDAL: Yes, that was the name. BEDFORD: And just as he was about to arrest him, his man sprang upon the rail and took a header into the sea. MRS. VIDAL: No- (To RAFFLES.) Escaped. ETHEL: Good! I’m so glad. RAFFLES: You were right about his friends at court Mr. Bedford. What a pity he doesn’t deserve them. By the way, what was his name? MRS. VIDAL: He called himself a Frenchman – Count Lauron de Bauderay – but he was as English as you are. BEDFORD: Could you describe the man? MRS. VIDAL (looking at RAFFLES): Yes. MRS. VIDAL: It was – so long ago – he has, without doubt, changed much since then. BEDFORD: Could you recognize him if you saw him again? 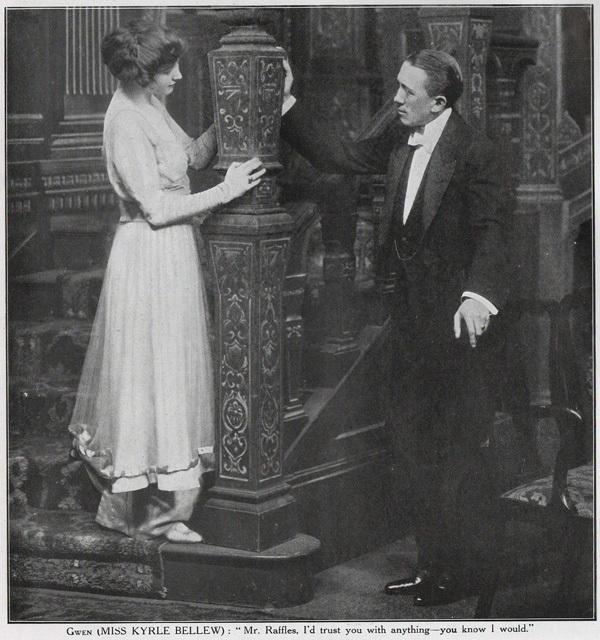 MRS. VIDAL (lowering eyes from RAFFLES who turns away his gaze – in triumph): Yes. BEDFORD: I shall give you an opportunity some day. The dearest wish of my heart is to meet the Cracksman, face to face. RAFFLES: I hope I may be there when you do. LADY MELROSE: I only hope it won’t be here. MRS. VIDAL: As likely here as anywhere. LORD AMERSTETH: What does it matter as long as your jewels are locked up in my safe every night? And the safe itself is the last place where any one would look for it. LORD AMERSTETH: Yes! I’ll show it to you. BEDFORD: He’s going to give us all a chance, Mr. Raffles. RAFFLES: Let’s have a look at the safe. 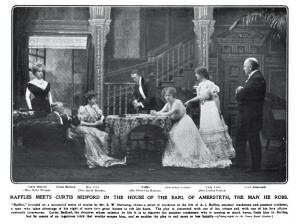 LORD AMERSTETH. There! another for silver in the dining room. LORD AMERSTETH (waving them off): It’s all right, Goldby. RAFFLES: Poor old Goldby! Won’t you play us something else? LORD AMERSTETH: We are protected from cellar to roof once the house is closed, and once that alarm is set it must ring if a door or window be forced or tampered with. I hope you approve the general scheme, Mr. Bedford? I’ve made it quite a hobby. BEDFORD: Lord Amersteth, I can only suggest one improvement. LORD AMERSTETH: A visit from the Cracksman? BEDFORD: That switch should be known to yourself alone. LORD AMERSTETH: Not trust my own household? BEDFORD: Not always- most thefts are through collusion with someone inside- a servant- anybody. In my now – occasional – occupation – everybody is a – suspect. MRS. VIDAL: Oh! (Laughing) I think after that I’ll say Good-night. LORD AMERSTETH: Nothing for the safe, Mrs. Vidal? GOLDBY: The silver, my lord. LORD AMERSTETH: Ah, come with me, Mr. Bedford, I’ll show you what we do with the plate. MRS. VIDAL: Good-night Mr. Bedford. I’m sure you are a great comfort to us all – even to Mr. Raffles. LADY MELROSE: Really, I think I shall follow Mrs. Vidal’s example. ETHEL: So shall I, though I know I shan’t sleep a wink. I’d much rather sit up all night to hear stories of the Cracksman. (Goes to LADY MELROSE, kisses her saying) Goodnight, Aunt Fanny! Good-night! (Takes off coral necklace. )33 Do you mind handing this to Papa just to make him happy! RAFFLES: Have you nothing for me, Miss Conran? GWENDOLINE: No – I’m like Mrs. Vidal. RAFFLES (sharply): What? (Nods.) I see. Nothing you’ll trust me with. GWENDOLINE: Mr. Raffles! I would trust you with anything – you know I would. (Forces a note of gaiety.) Although you have made me sympathize with that dreadful man. RAFFLES: The Cracksman! I’ve a sort of sneaking sympathy with him myself – more than he deserves. GWENDOLINE: Poor fellow! If he is all that you seem to think him- a fallen angel- I could almost find it in my heart to pray for him! RAFFLES (impulsively and with sentiment): I wish you would. RAFFLES: Then he won’t trouble us to-night. GWENDOLINE: I hope not – for his own sake as well as ours. Good-night. BEDFORD: Mr. Raffles! Lord Amersteth wants to show you the plate room. RAFFLES: Good! (Shows him necklace.) I’ve something for him. LADY MELROSE: I’ll say good-night before you go, Mr. Raffles. RAFFLES: Don’t be uneasy, Lady Melrose. LADY MELROSE: I am uneasy. BEDFORD: I’m sorry to hear that, Lady Melrose. LADY MELROSE: Not a soul except my treasure of a maid. BEDFORD: Excellent scheme for the present, Lady Melrose. Some one to suspect if anything transpires. BEDFORD: Don’t be uneasy, Lady Melrose. LADY MELROSE: I am so glad you approve. (LORD AMERSTETH enters crosses to safe looking at coral necklace. Showing necklace, laughing): Ah! Mr. Bedford we’ll drive over to Gray Towers in the morning and see if there’s anything fresh. Tomorrow’s match doesn’t amount to much. We’ve had the Incogs down the last two days, and we gave the Gentlemen of Dorset35 a tremendous licking at the beginning of the week. Raffles was far too good for them. But tomorrow’s village cricket pure and simple. Goldby’s playing, I’m playing- It’s the village eleven versus our household Brigade! Aha! The necklace! I was waiting for it. Put it in the safe, please. LORD AMERSTETH: Then we needn’t wait for Raffles; he doesn’t go in for jewellery. (Shuts and locks safe.) If you’ll forgive me, Mr. Bedford, I’ll turn in to read and to sleep with one eye open. BEDFORD: Will you leave the lights to me? LORD AMERSTETH: The lights! I forgot to tell you about them- here are the switches. The lower one turns out every light in the house. BEDFORD: Now that’s a very charming effect. CROWLEY: I say- what’s wrong with the lights? LORD AMERSTETH: Just showing them to Mr. Bedford. CROWLEY: Oh! you’re too unique. Fiddling about with the lights when we’re playing cards. And yet you expect me not to lose your money! LORD AMERSTETH: You don’t mind my leaving you? BEDFORD: Not in the least. One moment! who sets the burglar alarm? LORD AMERSTETH: Crowley as a rule. He’s always last. 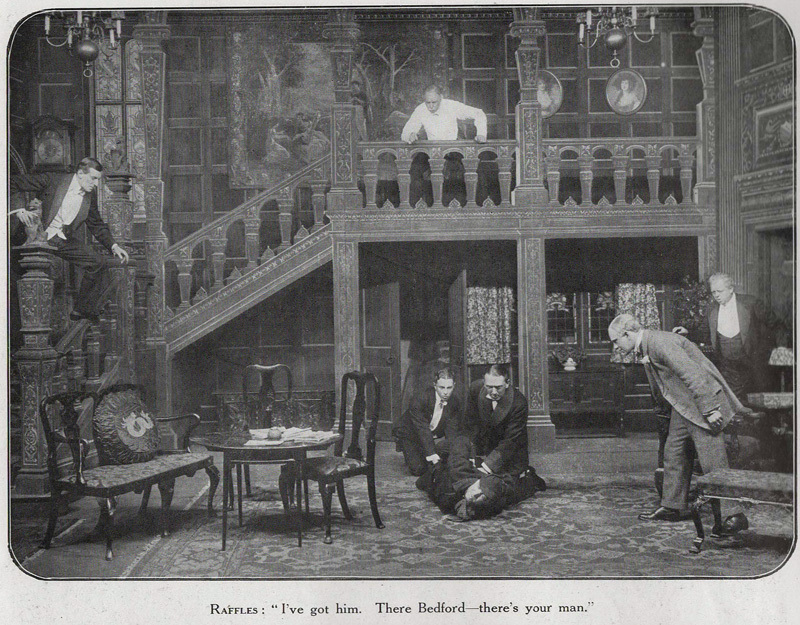 RAFFLES: Ah, Bedford, they’ve all deserted you? RAFFLES (offers cigarette case): Smoke a “Sullivan”? RAFFLES: So you are going to trap the “Cracksman”? BEDFORD: Sport for sport’s sake. RAFFLES: Of course I don’t. I only think. BEDFORD: Then you’d sooner be hare than hound. RAFFLES: My dear fellow! a million times! why not? BEDFORD: Fear paralyses the hunted criminal just when he needs his wits most. He fears every figure, every sound, and, sooner or later, he throws himself away. RAFFLES: The ordinary criminal may. He doesn’t count. The ordinary criminal is an indolent clown, who’ll do no work till the devil drives, and then does it so ill that a common constable of his own calibre is more than a match for him. The ordinary criminal in the same breath as the amateur cracksman! BEDFORD: You name them in one – not I. The Cracksman’s an artist or I shouldn’t be playing for him. RAFFLES: Then for the sake of argument, given a man who is superior to the machinery of law and detection, how can you capture him? Eliminate fear and the intelligent criminal is obviously superior to the intelligent policeman. BEDFORD: A reasonable answer would put the intelligent policeman on the same plane as your own ordinary criminal, and not name him in the same breath with – some detectives. Now that’s why I never work with Scotland Yard. If you’ll pardon the conceit, it takes an artist to catch an artist. RAFFLES (laughs): And you think the house is safe? BEDFORD: Reasonably. There is only one man who could crack this crib, and at such close quarters even the Amateur couldn’t escape me! RAFFLES: I wish he had occasion! (Sighs.) It would give us all such an opportunity of studying your methods. -look into the card room before turning in. MRS. VIDAL (foot of stairs- whispers): Arthur! MRS. VIDAL: I said I must see you to-night. MRS. VIDAL: It is necessary for your safety. RAFFLES: I can care for that. MRS. VIDAL: You will -if you care for me. RAFFLES: Have you no consideration for yourself? MRS. VIDAL: None, now that a trick of Fate has brought us together again. RAFFLES: As strangers. None of them dream that we have met before. Are you going to denounce me? MRS. VIDAL (looks at him, then sits): No! No! not that!- I- I can’t do that. MRS. VIDAL: You have forgotten? RAFFLES: Is there anything on this earth that I shouldn’t forget? MRS. VIDAL: Yes, you shall not forget me. RAFFLES: Good God, woman! Are you as reckless of your own reputation as you are of my safety? A word, a look, at this hour. You know what they mean to the world! Think of your husband, not of me. MRS. VIDAL: You came into my life before he did. RAFFLES: That’s an old story that need put neither of us to the blush- as it stands. MRS. VIDAL: But I -I have not forgotten! RAFFLES: A chance meeting on a summer voyage – there it ended. MRS. VIDAL (rises): It shall not end there! RAFFLES: Is that a threat? RAFFLES: It was a threat. You have been threatening to give me away all the evening, and I have dared you to betray me, but you won’t. There are obvious reasons why you are not going to give me away. RAFFLES: My will against yours. MRS. VIDAL: But Bedford’s alive. RAFFLES: Bedford! My dear lady! Bedford and I are like long-lost brothers. I have no fear of him – or of any other man – or woman. MRS. VIDAL: You have no heart. RAFFLES: What I say. You know as well as I do that I can’t afford to have a heart. I wish to God I could. MRS. VIDAL: So that you might offer it to that fool of a girl? MRS. VIDAL: You admit it – very well. Now listen to me, Arthur- she shall know you for what you are. RAFFLES: What would she say- what will she say when she knows- as she must know? BUNNY: I say, A.J., can you spare me a minute? RAFFLES: As many as you like. (Laughing) What’s the matter? RAFFLES: Yes, yes! I saw. BUNNY: Shilling points, that was my doing. I needn’t tell you why- sort of doubles or quits. Well, A.J., it’s doubles- and I couldn’t pay. BUNNY: No, I won’t. I can’t stand the fellow. He said – (Reproducing sneer)- “Of course, I could call the bets off, if I liked.” That finished me and I wrote him a cheque. RAFFLES: Then you have paid up, Bunny. Why do you talk as though you hadn’t? BUNNY: He’s sworn he’ll never pay my debts again. He’s a man of his word. He’d see me do time first. RAFFLES : How much is the cheque? RAFFLES (with a surreptitious smile): A hundred and fifty? RAFFLES: What a sum to send one to the devil! BUNNY: It isn’t much, is it? RAFFLES: Nominal, my dear Bunny- if you happen to have it- unfortunately I haven’t. I’m devilish hard up myself, or I needn’t tell you, old chap, it should be yours this minute. (Rises, patting BUNNY on the shoulder.) But don’t you worry-I’ll see you through. BUNNY: Oh, thanks! That’s just like you, A.J. Dear old chap, I knew you would. Yet I wouldn’t have come to you-even to you- only Crowley made me so mad – I felt that rather than not pay on the spot I’d – I’d steal the money. RAFFLES: You leave it to me. Your cheque shall be honoured. BUNNY: Thanks old chap. Unlucky in love, unlucky at cards, but more than lucky in my friend. RAFFLES: What was that you said about Love? BUNNY: I’ve lost at it … and lost to you. BUNNY: Yes, you’ve as good as won her from me, A.J., as I might have known you would. RAFFLES: What on earth are you talking about, Bunny? Who or what is it that I have won from you? BUNNY: The only woman I’ve ever cared for. BUNNY: Yes, Gwendoline- I don’t blame you. I don’t blame her. You are the better man. RAFFLES: I – the better man- God! If you only knew, Bunny, you who have known me longer and better than any others -if you only knew! A good woman’s love isn’t for the likes of me. BUNNY: But you’re the man. RAFFLES: I’m not- I don’t want to be. BUNNY: She has refused me, A.J. RAFFLES: You shall win her yet, old man. BUNNY: It’s too late. I’ve played and -lost. RAFFLES: But I have still to play, and I’ll win her for you. BUNNY: Then you don’t love her? RAFFLES (after a pause -lies): Love her! What nonsense. BUNNY (rises): I can hardly believe you- but I want you to know that I’d go through Hell to serve you. RAFFLES (his arm round BUNNY’S shoulder): I think you would, Bunny, and some day you may have the chance – meanwhile remember our old school motto: “Money lost, little lost. Honour lost, much lost. Pluck lost, all lost!”42 Cling to your courage, Bunny, and I’ll cling to mine. CROWLEY: A lovely night! Quite unique! Come for a stroll, Raffles. CROWLEY: Oh, Mr. Bedford, don’t shut that window, and don’t you lock me out. BEDFORD (coming in): Just turning in? RAFFLES: No! worse luck- there are one or two letters I must answer. BUNNY: I am-good-night, old chap. MERTON: Can I do anything for you, Sir? BEDFORD: Yes, Merton, you can go to bed. MERTON: I’d far rather sit up, Sir, and let you go to bed. BEDFORD: I am in bed. MERTON (takes handcuffs from pocket): Well, you’d better have these, sir. BEDFORD (taking them): Oh, guess I’d better. Good-night, Merton. RAFFLES (calls loudly): Lights! Lights! CROWLEY: What’s happened? What’s up? Let me help you. RAFFLES (struggling with CRAWSHAY): All right. I’ve got him, I’ve got him! There, Bedford, there’s your man. BEDFORD (has hand-cuffed CRAWSHAY): Well caught! RAFFLES: Not all our fancy painted him, I admit. BEDFORD: Say, this is not my man. CRAWSHAY (seeing chance, turning to BEDFORD, still on his knees): Course it aren’t, Governor. What ‘arm ‘ave I done? I never touched nothink. The window was open. I only crep’ in out o’ the cold. BEDFORD (shaking his head): I never forget a face. Call yourself Crawshay still? LORD AMERSTETH: Search him! Search him! 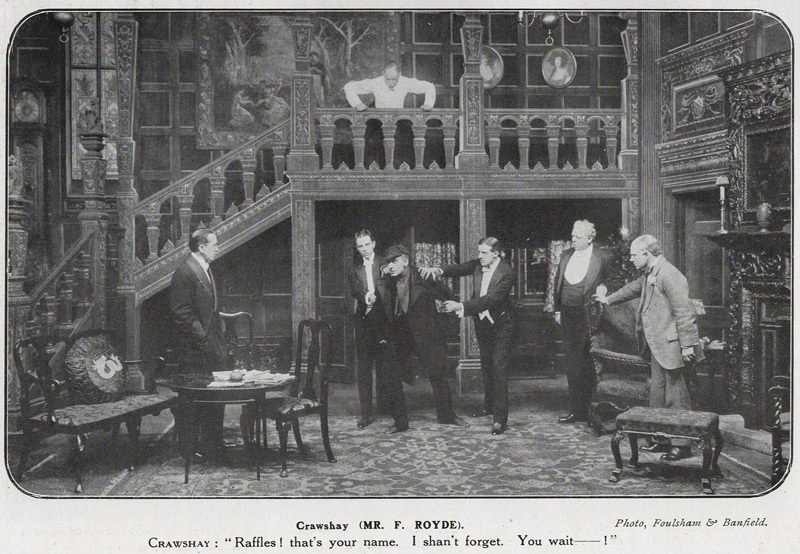 BEDFORD: Here, help me, gentlemen. GOLDBY: Shall I send for the police, my lord? LORD AMERSTETH: At once- tell Hardy – the new motor47 – let him bring them back. BEDFORD: Nothing – guess he hadn’t time – thanks to Mr. Raffles. CRAWSHAY: Raffles that’s your name? I shan’t forget! They can’t give me much for this -you wait- you wait! This entry was posted in Raffles The Amateur Cracksman. Bookmark the permalink. Act I is called in the American script, “When Greek Meets Greek”. The allusion is to the proverb, “When Greek meets Greek, then comes the tug of war”, a misquotation from a play by Nathaniel Lee which is now too well-established to ever be corrected. The expression is meant to imply that when two equally strong (or strong-minded) people contend, the struggle is likely to be long and fierce. “Wainscotting” is wooden paneling or woodwork that covers the lower part of the walls of a room. 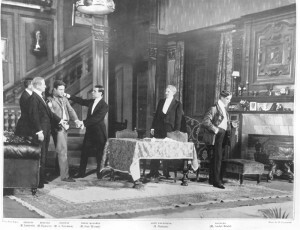 At the time this play is set, the term refers to a woman who is not actually a widow, but who is separated from her husband for long periods of time — in Mrs. Vidal’s case because he is away with the army in India. It was used earlier (late 18th, early 19th C) to mean the mother of an illigitimate child; and later (early- to mid-20th C) to denote a divorcee. The expression is usually “talk of the devil (and he’ll appear)”. They’re flies, and Raffles is honey. The American version emphasizes, again and again, Raffles’s alleged prowess as a BATSMAN at cricket, and usually employs the alternate term, BATTER. Maybe, in a day when batters and not pitchers were the heroes of baseball, the playwright thought that American theatergoers would not relate as well to a cricket bowler as to a cricket batsman. Certainly a SLOW BOWLER would have seemed a strange concept to Americans used to a game where the speed of every pitch (in the present day) is measured and posted on the scoreboard for everyone to marvel at. Or maybe the playwright was simply aware of the generally middle-class associations of the word “bowler” (someone who rolls a ball at an array of pins) in most American minds. In the American version, they play écarté. The playwright may have picked it because it was thought to be a particularly easy game at which to cheat. Both are two-person trick-taking card games. High stakes, in a time when a pound (twenty shillings) was worth about $130.00. The word “din” is nearly always used as a noun now, but its original use was as a verb, and it meant to cause something to sound loudly in one’s ears. This is a case of “nouning a verb”, a reverse of the more common “verbing a noun”. Verbing nouns weirds language. “Patience” – also known as “Solitaire”. “Jack-o-Lantern” was originally a synonym for a will-o’-the-wisp, a light caused by marsh gas burning over a peat bog at night. A figment of the imagination, in other words. These are referred to in “The Ides of March” and “The Criminologists’ Club” but we never get to see him steal them. In the stories they are said to have turned out to be paste. “Not a hundred miles away” is a common British expression meaning “close by”. In the American script, he is Captain Bedford, and he’s not an American. Ethel is implying that Mr. Bedford is “full of beans”, a slang expression meaning “enthusiastic”. Captain Redwood is a character in the play Jim the Penman – who, like Bedford, was also a detective and also played by E.M. Holland. Cesare Lombroso (1835-1909) was an Italian physician who studied and wrote extensively on criminology. Like many early eugenicists, Lombroso maintained that criminality represented a throw-back to a more primitive, subhuman type of man;, and that criminals could be identified through physical characteristics. Nearly all of the “physical anomalies” that distinguished Lombroso’s” criminal type” were unattractive (though some were merely deviations from average, which he evidently feared). For example, the criminal type was EITHER too tall or too short; had a jutting OR weak jaw; pointy OR snubbed fingers and toes; and was likely to be left-handed. –The impulse to be extensively tattooed, by the way, were a sure sign of a criminal nature. Max Nordau was a disciple of Lombroso, but was also influential in his own right as a co-founder (with Theodor Herzl) of the World Zionist Organisation. Nordau’s most famous work was “Degeneration” (1892), a polemic against “degenerate” modern society and social mores–and particularly against modern art. The views of both men, by the way, are in so many ways congruent with those of Adolf Hitler (especially on art) that one can easily imagine the three men as besties– had Lombroso and Nordau not both been Jewish. Lombroso’s fixation on the allegedly degraded physical appearance of “the criminal type” presented an obvious problem for his adherents: How to explain the fact that not all criminals actually were unattractive. Indeed, some criminals were SO attractive that onlookers at their trials for the most heinous crimes fell in love with them, showering them with roses, mash-notes, and offers of marriage (modern examples of this phenomenon will immediately occur to every reader). A few criminals came from good, or even high, society; and many had escaped detection for some time due to their personal charm. An answer to this quandary that quickly suggested itself was that the “taint” or disease of “Moral Insanity” (criminality) ALONE did not always cause physical ugliness. 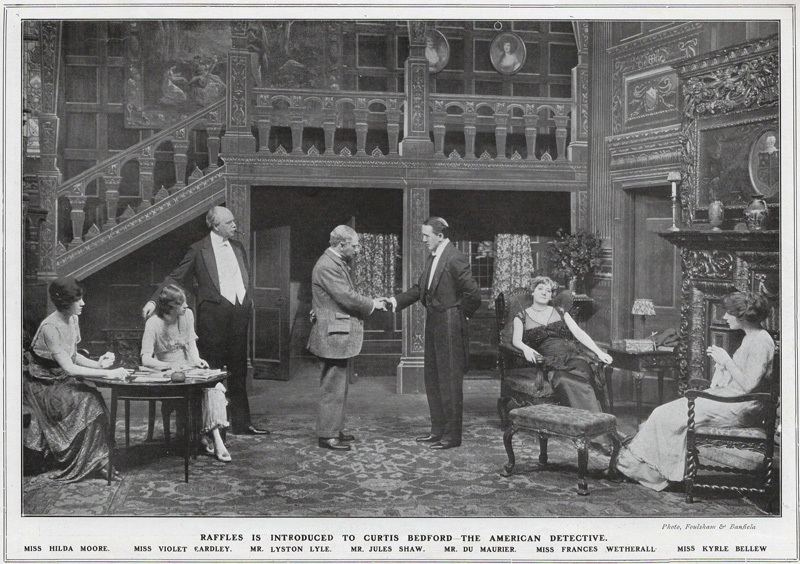 In the American version of the play, Raffles goes on at much greater length in describing the “Cracksman”, expanding his argument that he may be one of those who–though otherwise quite normal–is afflicted with the single mental aberration of a predilection for committing crimes. The length and depth of Raffles’s speech suggests that the topic was a pet of at least one of the playwrights– presumably Presbrey, since Hornung’s Raffles stories never allude to Lombroso, Nordau, or any of their theories; including the notion that criminality was hereditary. Where the only one of Raffles’s relatives that Hornung mentions is a sister who is blamelessly married to a clergyman, the stage Raffles’s father, we learn, turned highwayman in Australia. Charles Frederick Peace, a well-known English thief and murderer hanged for his crimes in 1879, was the SON of an animal (some say lion) tamer, but really did play the fiddle. The annotators can find no evidence that he was known for his bric-a-brac. 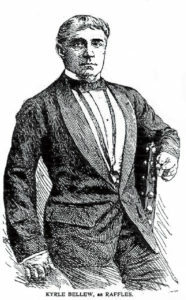 The Raffles of Hornung’s STORIES had no independent fortune, and lived entirely on the proceeds of his “misdeeds”, which he sold to unsavory fences. In only in a few instances (as in the case alluded to below, of the British Museum’s gold cup) did he return or dispose of what he had stolen in “some extraordinary way”. Because of this, Hornung was widely criticized for “making of a villain a hero”, but if he hoped to silence his critics by turning Raffles into a Robin Hood instead (the idea may have been Presbrey’s), it seems to have backfired. The play was condemned even more vociferously than the stories for making crime and criminals seems attractive. –And though the annotators have found no specific reference to it (yet), at a time when Socialism was catching on among the lower social classes, a remark like, “He’d endow a hospital with that necklace”, may have sent shivers of fear down the backs of some members of the upper classes. What, they might have asked themselves,would the servants (great fans of the Raffles play) make of the implication that a necklace valuable enough to have endowed a hospital was instead bedizening an old lady’s neck? More examples are given in the American version: “LADY MELROSE: The Duchess of Dorchester lost her diamonds the night of the costume ball. RAFFLES: They were sent to the Tower of London, if I remember. GWENDOLINE: Half of the historic Kenworthy plate disappeared during the excitement of an afternoon charity function. Bus. – short for “business”, the stage term for the incidental actions of the actors, such as lighting a cigar, or messing with the ash in an ashtray. “Look for the woman”. Behind every problem is (supposedly) a woman. The American version gives a brand name for the safe, Chubb Milner. Raffles has a matching one. A humorous reference to the Bible story (Mark 12:41-44, and Luke 21:1-4) in which a widow donates two “mites” (actually copper “leptons”, a small, almost valueless coin. “Mite” is the translation the King James version of the Bible uses) to the Temple treasury. Jesus, observing the deed, comments that the widow has contributed more than any of the rich men preceding her, since she gave all she had. At this time, a coral necklace was thought an appropriate everyday adornment for a child or very young lady, as it is pretty without being particularly valuable. On dress occasions, girls of Ethel’s age might wear pearls, but sparkling stones were only worn by ladies who were fully “out” in society. In the American version she reveals that she has been doing this for some time. 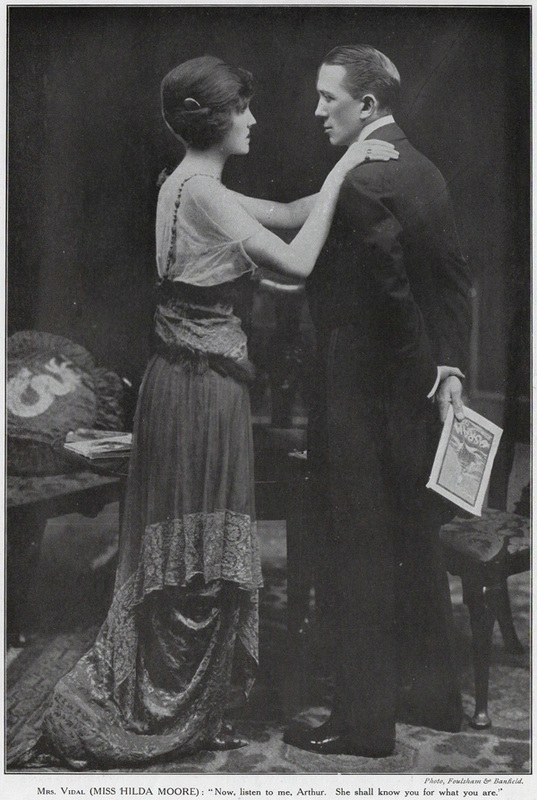 Bedford advises her to continue. Real cricket teams, not mentioned in the American version, presumably because the audience could not be expected to know them. The London Silver Vaults, which rents out vaults to householders for the storage of valuables, are located on Chancery Lane, London. Lord Amersteth is joking that he has created his own strong room on a par with those of Chancery Lane. “In the 19th C, “art for art’s sake” was best known as the slogan of those who despised the prevailing Victorian attitude that the value of art lay in serving moral or didactic ends. It was most often quoted in French, “l’art pour l’art”. 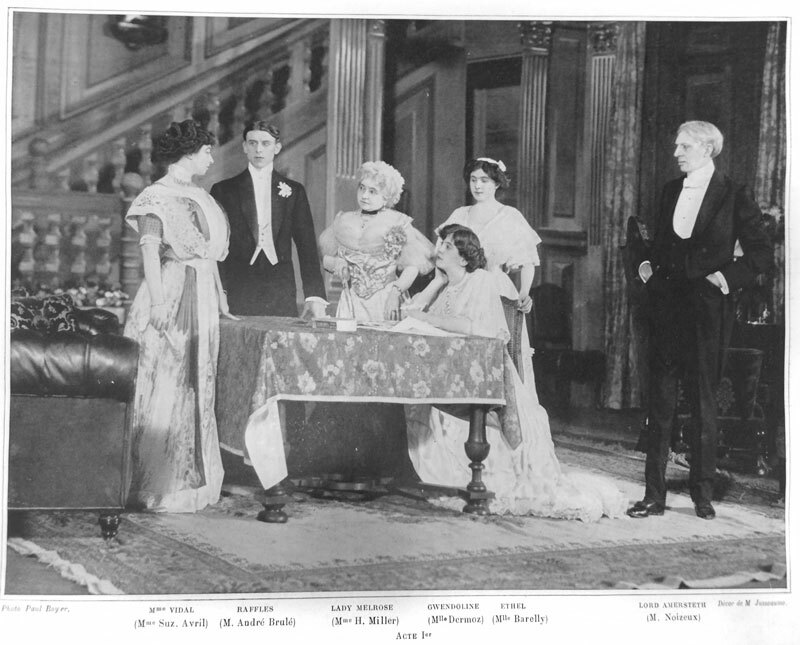 Changed from the American version due to the difference in hair color between Kyrle Bellew and Gerald du Maurier. In the American version Bunny believes Crowley has been cheating him. In the American version, Bunny threatens suicide at this point. In Hornung’s stories, of course, Bunny’s father (and mother) are both dead. This motto comes not from the Raffles books but from Hornung’s novel Young Blood. In the Raffles stories, the characters were forever choosing “saddle-bag” chairs in which to sit. A “saddle-back” chair is another animal entirely, simply being any kind of chair in which the back has a saddle-shaped depression in the top middle. The one Raffles chooses now is high-backed, but even a tiny slipper-chair might be saddle-backed. 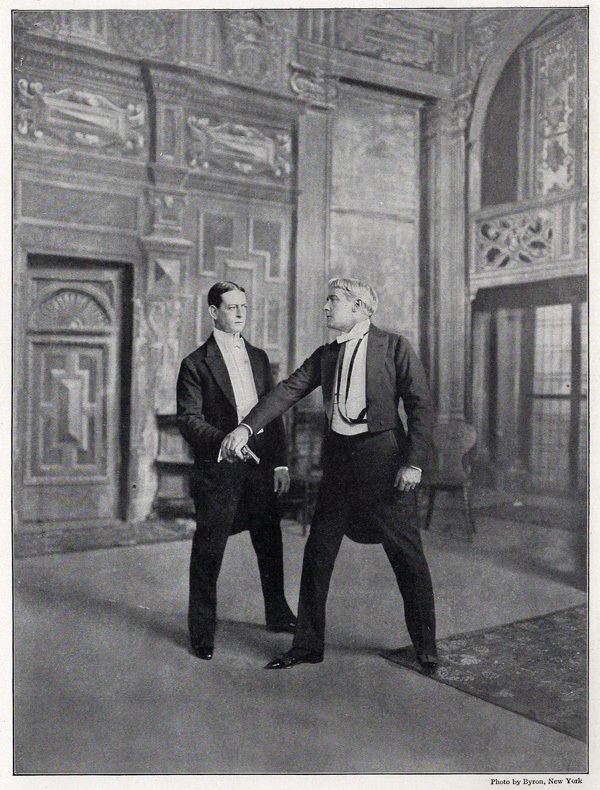 In the American version, Merton doesn’t show up until Act III. A “float” is a type of light. “Batten” – a cross-member in the structure to which stage-lights are mounted. “Motor”- that is, motor car.